Harajuku is fabulous for the people-watching and accessory shops, but once you’ve been there, tried that, consider Koenji. This neighborhood, between Tachikawa and Shinjuku, is billed as the center of Tokyo’s alternative youth culture. Street fashion, vintage clothes and consignment shops abound here. It was largely untouched by the bombs of World War II, so it’s also great for those who want to stroll through an older neighborhood of Tokyo. Some of the second-hand clothing shops are highly curated. One is devoted to the Little Red Ridinghood look, another to the cutsey-Alice-in-Wonderland look, and a third to the 1950s cowgirl vibe. Some specialize in high-end European clothes, some in embellished t-shirts. Unlike Shibuya and Harajuku, this area seems relaxed and more like a neighborhood than a commercial shopping area. I explored the area to the south of the train station, specifically Pal Street and Look Street. Vintage stores and little shops line both sides of these streets. As evening falls, strings of red lanterns light up the side streets, luring thirsty shoppers to the many local izakaya (taverns) and specialty restaurants. I went on a weekday afternoon. Some shops were closed but the neighborhood still seemed open for business. I hear the best time to go is after 3pm on the weekend. Some of the trendy stores stay open until 10pm or later. Next time, I intend to look at the north side of the tracks to find the Kita-Kore building, where pop star Lady Gaga shopped when she came to Japan in 2011. The building has five shops that the New York Times describes as “equal parts used-clothing outlet and high-end recycling atelier.” Where else are we going to find fashionable body armor, or footwear that combines Nike uppers on traditional Japanese wooden sandals? WE COULD USE DESCRIPTIONS HERE OF THE CUTE-LOOKING CAFE NOBLE AND TACOS CAFE. AMONG MANY OTHER PROMISING SPOTS. Smart Sushi: This is a conveyor-belt sushi restaurant, but the better food arrives by special order. You use a touch-screen overhead to order, and the food comes shooting down the track at you, above the conveyor belt, on a wooden “boat.” Take your food and send the boat back by pressing the glowing red button. Food was standard sushi fare. Cheapest sushi order was ¥120. 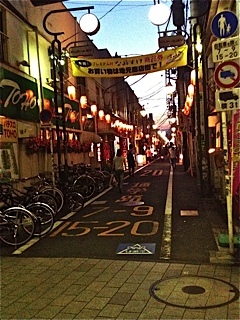 Near the top of the Pal street mall, a five-minute walk from Koenji station. TRAIN DIRECTIONS: From Fussa Station, take a train bound for Tokyo. Change trains in Tachikawa to get on the Chuo Line, heading for Tokyo. On a local service train, Koenji is 12 stops after Tachikawa. If you’re on an express train, change at Mitaka to a local Chuo Line train and go five more stops to Koenji. Alternatively, stay on your express train all the way to Nakano and backtrack one stop to Koenji. Total travel time: 50-60 minutes. It’s a short walk from the station to the shops of Pal and Look streets, Exit Koenji station by the south exit and turn right. Walk parallel to the tracks about 300 feet, toward the roof-covered street with a sign that reads “Pal.” Turn left on Pal and start browsing. If you keep going straight after the roof ends, you’ll be shopping on Look Street. Posted in Daytrips, Koenji, Second Hand Stores, Shopping, TOKYO, Truth or Dare!